Hale, Shannon. Midnight in Austenland. 288 p. Bloomsbury USA. 2012. Hardcover $22.00. ISBN 9781608196258. When I heard that there was going to be a follow-up to Austenland (Bloomsbury, 2007), the first foray into adult-level fiction by Newbery Honor winning author Shannon Hale, I thought, "Yay! Wait... really?" Because that story wrapped up so nicely, you see. Did it need a sequel? 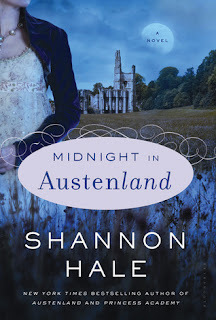 Maybe, maybe not-- but Midnight in Austenland is a companion book, not a direct sequel. And it's so much fun! There's a new main character, Charlotte, a recent divorcée who finds herself drawn to the titular Jane Austen reenactment vacation spot. As Charlotte immerses herself in the Regency-era lifestyle, there's an appealing blend of humor, self-discovery, and romance that fans of the first volume will love. And this time around, a new element is introduced in the form of a clever and engaging mystery. I had a great time reading this book. I have to say, Shannon Hale is one of my very favorite authors. 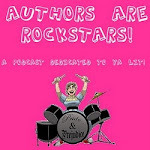 I read and love anything she writes, whether it's written for young readers or adults. Her writing for adults is markedly different from the books she writes for kids and teens-- it's conversational, quirky, and even a little sassy, rather than lyrical and lush. Reading one of her adult-level books feels kind of like getting a chance to hang out and chat with her. Midnight in Austenland is fresh, fast-paced, and simply an enjoyable read-- the perfect book for a cozy evening in. Brew a pot of tea and get ready for a delightful reading experience. This book just came out at the end of January from Bloomsbury USA. ARC for review provided by the publisher via NetGalley. I've never even heard of Shannon Hale or Austenland. But these books sound like great fun. Thanks for the recommendation. I'm going to check them out! Ohh, Shannon Hale is amazing! I hope you enjoy discovering her work.